There are lakes everywhere in Killarney at the moment. Lowlying land is all under water. Yesterday (Sunday, December 6) I spent three intriguing hours along by lake margins that I had never seen before. My appetite was whetted by the piece on the Radio Kerry web site showing the thundering, white, contorted mass of water coming down Torc Waterfall. Joining the shores of Lough Leane/the Lower Lake opposite Muckross Abbey a first realisation of the effects of 48 hours of non-stop heavy rain on Friday and Saturday last. A few hundred yards down Lover’s Walk it was completely impassable. There were lots of people out walking all marvelling at the height of the water and wanting a breath of fresh air after the claustrophobia of the previous days. The big beech and yew trees surrounded by still water at the edge of the lake suggested images of a quiet backwater off a great rain forest river like the Amazon. Having a fertile imagination makes walking in the outdoors even more enjoyable. 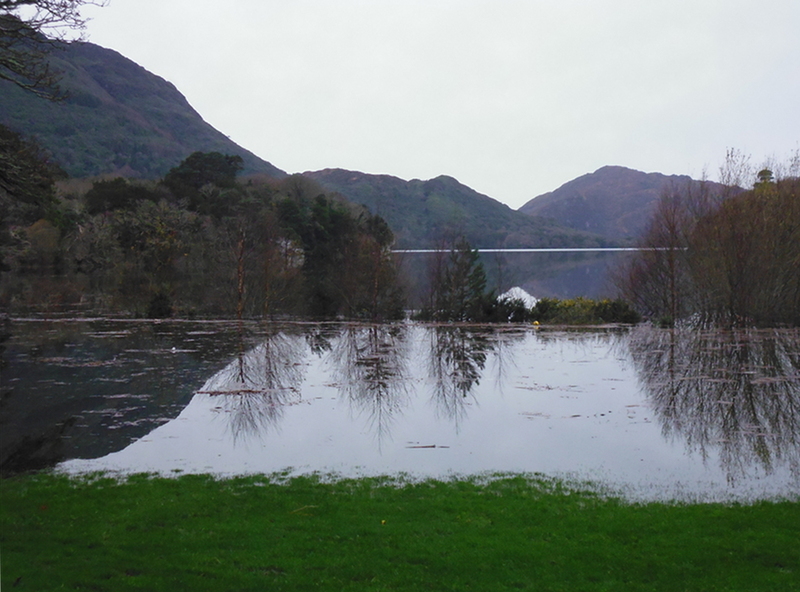 The level of the water at the Garden Quay on Lough Leane appeared to be eight or nine feet higher than it was at the end of October. The Muckross Rowing Club boathouse was completely inaccessible. Here the water was almost up to the road. 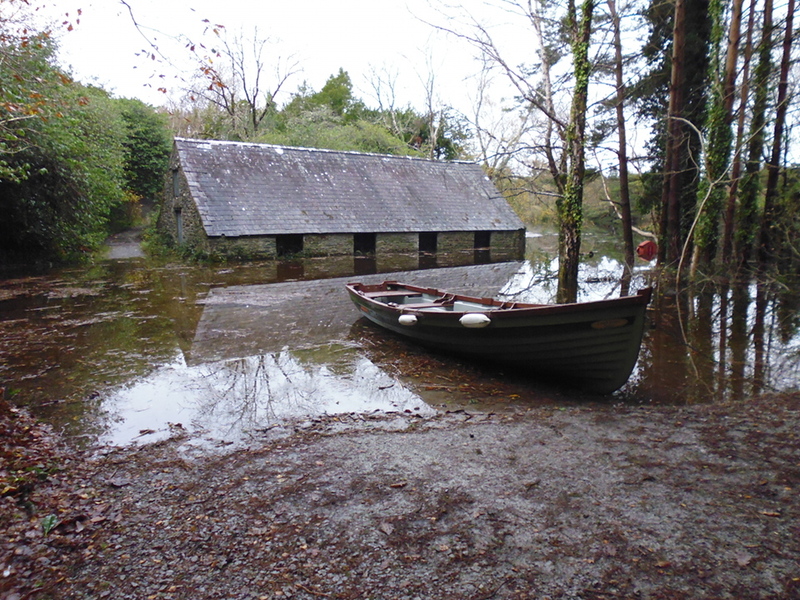 Access to the Muckross peninsula was completely cut off, the water was up to the Arthur Young House. At the end of the ice age the water levels in the Killarney Valley were much higher. The levels of these past days must have been what the they were like as they very gradually dropped. All along the way people were stopping and chatting. One eagerly looking forward to a son coming home for Christmas. Everybody marvelling at the water. Several hundred yards at the start of the Jackoboys walk was flooded. The wet boathouse at the start of the Dundag headland was completely inundated. Two young women visitors used their tablet to record the scene. A mother with two young children was determined to get to see Torc Waterfall. She was not put off because the Park roads between Muckross House and the falls were all flooded. “The jaunting car road is not flooded”. Skirting floods by going through Muckross Gardens an exotic maple was surrounded by, and still had a generous coat, of the most colourful Autumn leaves. Then by the entrance to the Muckross Traditional Farms there was a gaggle of talking parents and excited children were preparing to go on the most exciting Santa excursion ever seen in this part of the world. By the time I got home it was nearly dark. Now it is Winter. Christmas is coming. And the outdoors are as exciting as ever.